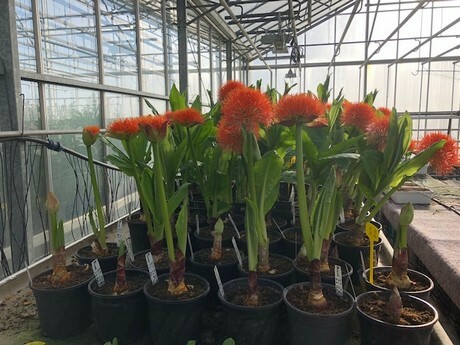 Ever heard of scadoxus? According to the internet it's also called the paintbrush lily or bloody lily, and botanists know it as the Haemanthus Katharinae. It is a wonderfully exotic, very exclusive and little known flower. And this flower is looking for a grower. 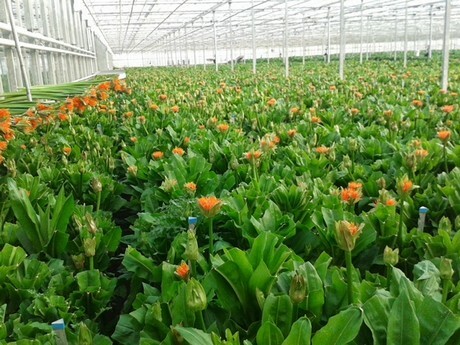 Tjerk Vening of Könst Alstroemeria: "Which means that we believe a market exists for this flower. It is being grown, but practically for only cutting, and there is no one who sells it as a pot plant." In the Netherlands the flower is grown by René Koning from Hoogwoud, and abroad a little bit is grown in Portugal and Kenya, where the flower is originally from, and that is about it. It so happens that Konings was recently looking for assistance in sales, and the man he found for the job, director Hans Könst of Könst Alstroemeria, is a real plant aficionado. At the end of 2016 the cooperation was a fact. The trading is done by themselves, but the breeding and propagation activities are shared with Könst, who takes care of propagation at René, but for a large part also in the aforementioned countries Portugal and Kenya. Tjerk: "We also do a lot of research ourselves. It is a real niche product and relatively little is known about it. There is some experience in cutting, particularly growers in Kenya, but with regard to growing in pots we really know very little, while, so we think, there is profit to be made"
Why that is the case, besides the exclusivity and the tropical look and feel of the flower itself, is easy to explain according to Tjerk: "It is a fairly easy growth, which requires relatively little attention. You should not have expensive space of empty greenhouse, that doesn't pay, and you also only have one flower per bulb per year, but there is good money to be made. An average of 1.80 euro per stalk of all lengths. Besides, there has never been any promotion for the flower. If that were to happen, then the consumer should be enticed, we gather from the reactions of those around us. We are certainly not the only ones who see a potential in this. In a couple of years the number of stalks should be easy to double or triple. The competition abroad does not have to be feared. Although production is the best in Kenya, the stalks are too big and heavy for transport. It is simply too expensive, except for a few shipments to a rich Russian or sheikh. A sudden overproduction is also something which does not have to be feared, as propagation and breeding take years." In short: Scadoxus in pots, who's offering?